These adorable babies have different moods so their faces capture a wide variety of emotions. Each durable vinyl doll is washable and comes dressed in a reusable diaper with Velcro tabs. These adorable babies have different moods so their faces capture a wide variety of emotions. 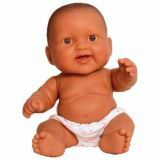 Each 14" durable vinyl doll is washable and comes dressed in a reusable diaper with Velcro tabs.